The legendary TOUCH CARD® reader is one of SecuraKey’s major contributions to Access Control. Secura Key replaced unreliable reed switches and pickup coils with an array of self-calibrating Hall-Effect sensors, which read the polarity of magnetized locations on a Barium Ferrite card. The user places the card on a non-magnetic stainless steel plate, which eliminates the requirement for a card slot, and protects the circuitry from weather and vandalism. Extremely rugged weatherproof housings with high-security locks and steel mounting plates have kept these units in service for many years. They are still widely used in gate, parking, and telephone entry applications due to their reliability and simplicity. 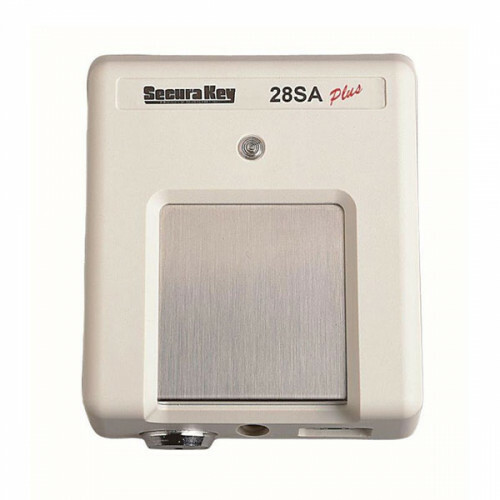 28SA-Plus SINGLE DOOR ACCESS CONTROL The 28SA-Plus is a highly sophisticated, yet simple-to-use card access control unit for single or multi-door applications. The unit may be programmed with a PC terminal program, either locally or with the use of a modem. Basic programming functions can also be accomplished by using programming cards. Transaction information is stored by the unit and may be downloaded to a PC or serial printer. Up to 128, 28SA-Plus units can be connected together in a single twisted pair RS-485 network using the included RS-485 cable and SK-NETTM Software for Windows® XP/Vista/Window® 7. A remote reader (SK-029W) may be connected to the 28SA-Plus to allow access control in both directions through a single passageway, including true IN/ OUT anti-passback capability. Three inputs are provided which are user programmable as Door Monitor, Tamper Monitor, Remote Inactive, Remote Open, Arming Circuit, Bell, or User Defined. The Limited Use feature allows up to 4000 cards to be programmed to work for up to 500 uses, days, weeks, or days after the first use. The 28SA-Plus has 15 Access Control Time Zones and one door-unlock Time Zone. Each time zone covers a full week of access control plus Holidays in ½-hour segments. Daylight Saving Time is selectable to meet new or future requirements. 32 holidays, automatic Daylight Saving Time. These SecuraKey products are warranted against defects in materials and workmanship for 2 years. SecuraKey will replace any Secura Key manufactured product that fails to perform as intended. This warranty does not include freight, taxes, duties, or installation expenses.